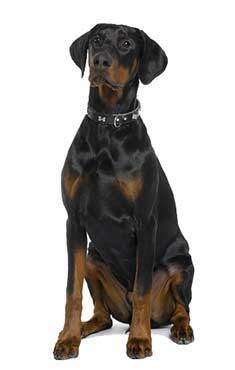 The Doberman Pinscher dog breed has a compact, muscular and powerful body. Proud, alert, athletic, with endurance and speed. Devoted and fearless, the Doberman Pinscher is widely known as a "police dog" for its military duty during World War I. The Doberman Pinscher originated in Germany. Male Doberman Pinschers range from 26 inches to 28 inches. Female Doberman Pinschers range from 24 inches to 26 inches. Doberman Pinschers range from 66 to 88 pounds. Doberman Pinschers are typically solid black, brown, or blue and fawn with rust markings on the head, body and legs. Doberman Pinschers' coats are short and close to their bodies. Coat care is minimal. The Doberman Pinscher is a highly energetic, intelligent dog breed. Initially suspicious of strangers, the Doberman Pinscher is a capable watchdog. Loyal and adventurous, it likes a mental challenge. The Doberman Pinscher can be a domineering dog breed. The Doberman Pinscher is susceptible to Wobblers Syndrome and cardiomyopathy. Doberman Pinschers need frequent exercise and daily mental challenges. They make good housedogs, although a fenced yard and plenty of stimulation is crucial for this highly energetic breed. The Doberman Pinscher is in the Working group. The stereotypical picture many people have of a Doberman Pinscher is the snarling, teeth-gnashing ultra-protective bodyguard, but you may be surprised to learn that when properly socialized, Dobies are often described as strong, savvy, sweet, and sassy. They can be wonderful companion animals for the whole family, and they excel at many dog sports. In the town of Apolda, Germany, a man named Karl Friedrich Louis Dobermann earned his living as a tax collector around 1890. He also ran the local dog pound, so when he set out to create a dog that would protect him as he made his collection rounds, he had plenty of varied breeding stock from which to choose. Dobermann started cross-breeding dogs in order to find a new breed that was the perfect combination of strength, loyalty, intelligence, and ferocity. It is likely that many dogs had a part in forming this new breed, including German Pinschers, Beaucerons, Rottweilers, Greyhounds, Great Danes, Weimaraners, German Shorthaired Pointers, Manchester Terriers, and German Shepherds. The American Kennel Club standard describes a Doberman as of "medium size, square build, and short coat." Their compact build and athleticism allow them to travel with both speed and endurance. Standing somewhere between 24 and 28 inches tall, the Doberman should be as long as he is high. Dobies generally weigh between 60 and 100 pounds. The tail of a Dobe is generally docked, although that practice has recently become controversial. Most European dogs' tails are not docked, and since most dogs no longer run loose through bramble-infested fields, the reasons for docking all Dobies' tails are not as clear as they once were. Originally, most dogs' tails were cropped to prevent damage when the dog was running loose and could easily get the tail caught on branches, brambles, or other wild things. 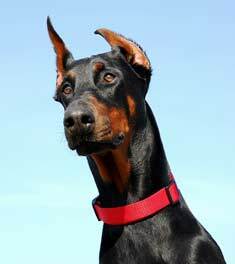 Similarly, most Dobermans in the United States have cropped ears, which can help them to localize sounds more efficiently when they are on guard duty. Cropped ears stand straight up and are pointed at the top. In many other countries, ear cropping is illegal, and the Dobie is seen with short, pendulous ears. If the dog's ears are to be cropped, this should be completed between 7 and 9 weeks of age. After part of the dog's ears are trimmed off, the ears are taped onto a post for about 4 - 6 weeks to allow the cartilage to stand upright as the puppy grows. For show dogs, posting may take several months, which can be uncomfortable for the dog. 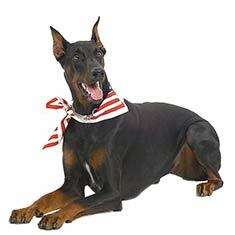 Only four colors are allowed when showing Dobermans, each combined with rust-colored markings. The four allowable colors are black, red, blue, and fawn. Blue is simply a black coat that has been genetically diluted to a lighter shade, while fawn is a diluted red coat. The genetics are as follows: Black is dominant over red, so any given black dog may bear two black genes or a black and a red. A red dog will carry two red genes. This becomes important if you choose to breed your dog, as you will be able to predict which colors will be in the litter. For example, if you breed a red sire and red dame, you can only get red pups. By keeping careful records when you breed black dogs, you can figure out which dogs carry two black genes and which carry a black and a red. Once you know this, you can selectively breed based on the colors you want to have in the puppies. To get the diluted shades, both parents must carry the gene for dilution in addition to the color genes as noted above. A blue or fawn dog will have melanocytes deposited in the hair shafts in an irregular pattern rather than in the solid pattern of the reds and blacks. The irregular pattern makes the hair softer which can cause the dog to have ingrown hairs that are unable to poke through the hair follicle. This can cause staph infections, particularly in puppies. Color dilution alopecia (CDA) is a genetic disease that can cause baldness due to the softer hair in a blue or fawn Doberman. It is thought that a genetic factor, independent of the dilution gene, is responsible for CDA. An affected dog's coat will begin to thin out between the ages of one and three years, and the problem is most noticeable along the back and flanks, but in severe cases may involve the whole coat. Although Doberman Pinschers with CDA are otherwise healthy, they can pass along the coat problem to their puppies. For this reason, fawn and blue Dobermans should not be bred until after the age of three years so that their coat can be verified as being free of any problems. There are dogs who have descended from an inbred family of white Dobermans. Known as "albino" dogs, these animals are at increased risk for any number of genetic disorders and should be avoided. When Dobermans are used for the protection of property or people, they are trained to be intimidating and fearless; however, they must be obedient enough to attack only when commanded to do so. 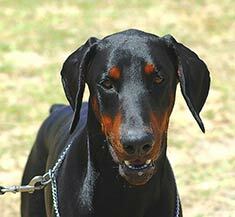 For people who do not need or desire this level of protection, Dobies can be trained to be very gentle and loving. They are sociable with both people and other dogs, although they will always have the ability to spring to the defense of those they love. Because of their high intelligence, these dogs are easily trained for the amount of protectiveness you wish them to show. As a breed, Dobermans generally show more aggression to strangers than to those with whom they live. They generally rank near the middle in studies determining how they will react to other dogs, both those living in the same home and those who are strangers. Where a Dobie owner can get into trouble is by not thoroughly training the dog. Their sheer size and strength make them potentially dangerous if not trained to sit and stay on command. According to a study done by the Center for Disease Control and Prevention, as reported in the medical journal Pediatrics, one of the most important determinants of whether or not a dog will bite is the level of responsibility taken by the dog's owners. Dobermans have been known to sense danger before even their owners are aware that anything is amiss. For this reason, it is imperative that you provide a leadership role for this dog breed to avoid his running off to "take care of business" when perhaps there are easier ways for the danger to be dissipated. Aside from the tendency toward aggression, there are two things prospective Doberman owners should keep in mind. First, these big, muscular dogs require stimulating mental and physical exercise every single day. Lacking this outlet, they may become destructive as they make their own fun inside your home. Second, this is not a breed that will enjoy living alone outside in the doghouse. These dogs are companionable and like to remain in close proximity to their families. Many of them are even convinced they are lap dogs! Like most dogs of their size, Dobies can be expected to live anywhere from about 10 to 14 years. However, there are some common health concerns with the breed. More than any other breed, Dobies are prone to diseases of the prostate; however, the risk for prostatic diseases can be drastically reduced by neutering. Dobermans also have a high incidence of dilated cardiomyopathy, which is generally fatal within less than two months following diagnosis. In this disease, one or more chambers of the heart become enlarged, and the heart loses its efficiency in pumping out blood to the organs. Approximately 40% of all cases of DCM are in Dobies, and death follows much more frequently in Dobermans than in other breeds, who may last up to eight months after diagnosis. The cause of the disease is currently unknown, but it is thought to have a genetic component. Is the Doberman the breed for me? If you are looking for an intelligent, lovable dog who is fully capable of protecting your family and home, this may be just the dog for you. However, if you don't have the time, patience, energy, or commitment to thoroughly train and socialize your dog throughout his or her lifetime, you would be well-advised to consider a lower-maintenance breed. Find Doberman Pinscher Puppies with our Free Breeder search!